This e-mail address should never be used for matters on appeal and legal notices. Communication related to appeals may be delivered to the Board Office, e-mailed to Suzann_M_King@mcpsmd.org, or faxed to 301-279-3860. All other legal notices and official communication must be delivered to the Board Office in writing as required by law. Beyond the Boardroom is an MCPS TV production that gives the public an opportunity to get to know each Board member in their own words, outside of the Boardroom. These short videos provide insight into Board members’ personalities and passions. The Board of Education will hold its Evening Business Meeting on Monday, April 29, 2019. The business meeting will begin at 5:30 p.m. and closed session will begin at 4:00 p.m. The meeting will be broadcast live on Comcast Channel 34, Verizon FIOS Channel 36, and RCN Channel 88. Meeting is rebroadcast at 1:00 p.m. on the Saturday and Sunday following the meeting. The Montgomery County Board of Education is seeking to fill one vacancy on its five-member Ethics Panel. Applicants must submit a letter of interest along with a resumé or other documentation to support the application by 5:00 p.m. on Monday, May 13, 2019. The vacancy is for a three-year term beginning on July 1. 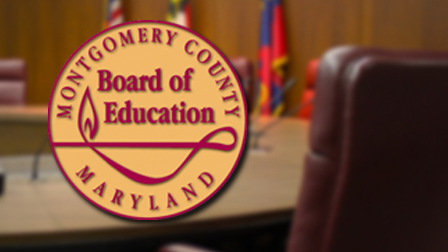 The Board of Education wants to hire external consultants to conduct an in-depth review and analysis of how existing school and cluster boundaries support or impede the effective use of school facilities in Montgomery County Public Schools. Are you interested in providing feedback concerning the scope of the consultants’ work? If so, please click below. The Montgomery County Board of Education recently sent a letter to the community about an examination of class size in MCPS and an analysis of current school and cluster boundaries. These items were discussed at a Jan. 8 business meeting.